From Albuquerque - I 25 to Bernalillo, 2nd exit NM 550, 23 miles to San Ysidro; right to NM 4 for 7 miles to State Road 290 3 miles to the winery. From Santa Fe - I 25 to Bernalillo, 1st exit on NM 550, 23 miles to San Ysidro; right to NM 4 for 7 miles to State Road 290 3 miles to the winery. 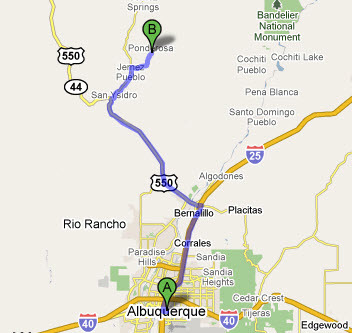 or you can to North to Los Alamos and come across the Jemez Mtns on NM 4.